Rather than buy blindfolds, you can make them with scraps of fabric. Make sure you ahve enough for each pair of students. Ask your students if they have ever tried to do anything with one eye closed. Was it harder, easier or about the same as with both eyes open? Try to catch the ball with only one eye open! Arrange your students in pairs for this activity. Distribute 1 ball or beanbag and 1 blindfold to each pair. Have each pair stand about 3 meters away from each other and gently toss the ball back and forth. 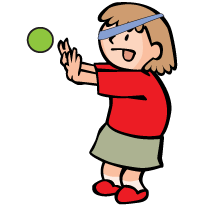 After a few minutes, have one child in each pair place the blindfold over their left eye, and then toss the ball back and forth with their partner again. After a few tosses, the partners should switch roles, with the second child wearing the blindfold. After each child has worn the blindfold and tossed the ball back and forth with their partner, bring your students together to talk about what they’ve done. Was it easy or hard to catch the ball with both eyes uncovered? Was it easier, harder or the same with their left eye covered? Did this surprise them? What do they think might happen if they tried covering their right eye? Have each pair repeat the process, but this time with the right eye covered. Once they’ve all tried it, ask them if it was easier to catch the ball with their left eye covered, their right eye covered or was it about the same?